Welcome back to Something About Coins! 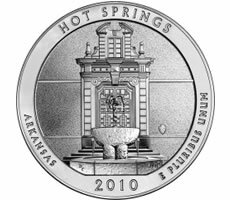 The U.S. Mint anticipates high demand and a slow ordering system for Thursday's big launch of the collector version five ounce silver ATB Hot Springs Coin. The 2011 bullion ATB coins started hot on Monday, according to a mint sales report. Doug Winter defines coins that are called widgets and lists some examples, and the Iceni gold hoard of 840 Iron Age coins is back in the news. The Royal Canadian Mint recently launched a coin featuring a wild rose and Swarovski crystals. Wednesday was busy at the Central States Numismatic Society's Convention, per John Brush of David Lawrence Rare Coins. Enjoy!